Job approval numbers for Japan’s Prime Minister Shinzo Abe are in freefall. Abe's support has now fallen below 30%, and his Liberal Democratic Party recently suffered heavy losses stemming from a slew of scandals revolving around illegal subsidies received by a close associate of his wife. But as we have seen back on this side of the hemisphere, the public’s interest in these political scandals can be easily overlooked if the underlying economic conditions are favorable. For instance, voters were apathetic when the House introduced impeachment proceedings at the end of 1998 against Bill Clinton for perjury and abuse of power. And Clinton’s perjury scandal was indefensible upon discovery of that infamous Blue Dress. The average citizen, then busily counting their chips from the dot-com casino, were disinterested in Clinton’s wrongdoings because the 1998 economy was booming. Clinton remained in office, and his Democratic party gained seats in the 1998 mid-term elections. Therefore, Abe's scandal is more likely a referendum on the public’s frustration with the failure of Abenomics. When Shinzo Abe regained the office of Prime Minister during the last days of 2012, he brought with him the promise of three magic arrows: an image borrowed from a Japanese folk tale that teaches three sticks together are harder to break than one. The first arrow targeted unprecedented monetary easing, the second was humongous government spending, and the third arrow was aimed at structural reforms. The Prime Minister assured the Japanese that his “three-arrow” strategy would rescue the economy from decades of stagnation. Unfortunately, these three arrows have done nothing to improve the life of the average Japanese person. Instead, they have only succeeded in blowing up the debt, wrecking the value of the yen and exploding the Bank of Japan’s (BOJ) balance sheet. For years Japanese savers have not only seen their yen denominated deposits garner a zero percent interest rate in the bank; but even worse, have lost purchasing power against foreign currencies. The yen has lost over 30 percent of its value against the US dollar since Abe regained power in 2012. Meanwhile, the Japanese economy is still entrenched in its “lost-decades” morass; and growing at just over one percent year over year in Q1 2017. Japan’s dramatic slowdown in growth, which averaged at an annual rate of 4.5 percent in the 1980s, fell to 1.5 percent in the 1990s and never recovered. In addition to this, higher health care costs from an aging population have driven government health care spending to move from 4.5 percent of GDP in 1990, to 9.5 percent in 2010, according to IMF estimates. Incredibly, this low-growth and debt-disabled economy has a 10-Year Note that yields around zero percent; thanks only to BOJ purchases. Prime Minister Abe’s plan to address this recent scandal-driven plummet in the polls is to increase government spending even more and have the BOJ simply step up the printing press. In other words, he is going to double down on the first two arrows that have already failed! However, the Japanese people appear as though they have now had enough. Japan's National Debt is already over a quadrillion yen (250% of GDP). And the nation would never be able to service this debt if the BOJ didn’t own most of it. The sad truth is that the only viable alternative for Japanese Government Bonds (JGBs) is an explicit or implicit default. 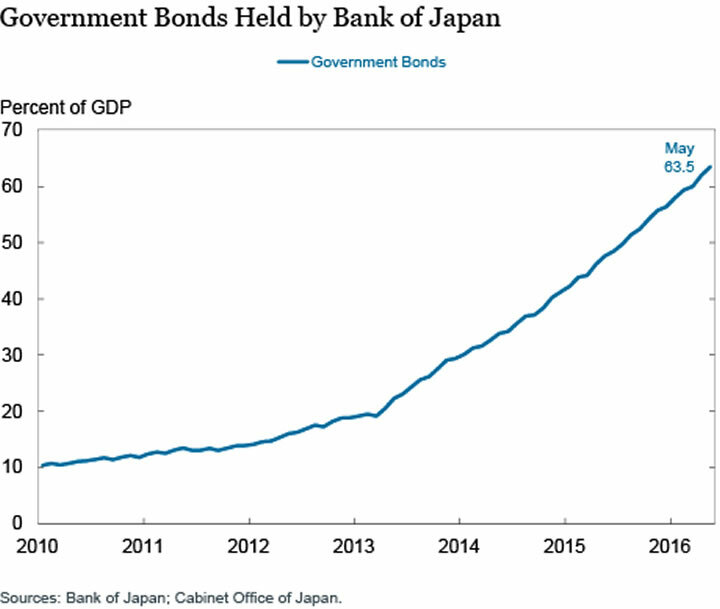 And, a default of the implicit variety has already occurred because the BOJ now owns most of the government debt—total assets held by the BOJ is around 93% of GDP; JGBs equal 70% of GDP. Japan is a paragon to prove that no nation can print, borrow and spend its way to prosperity. Abenomics delivered on all the deficit spending that Keynesians such as Paul Krugman espouse. But where is the growth? Japanese citizens are getting tired of Abenomics and there are some early indications that they may vote people in power that will force the BOJ into joining the rest of the developed world in the direction of normalizing monetary policy. The reckless policies of global central banks have left investors starving for yield and forcing them out along the risk curve. But interest rates are set to rise as central banks remove the massive and unprecedented bid on sovereign debt—perhaps even in Japan. A chaotic interest rate shock wave is about to hit the global bond market, which will reverberate across equity markets around the world. Is your portfolio ready? 08 Aug 17, 15:09 where is the rise in interest rates? Sorry but where is this IR rise? Everyone knows the shock of tightening will stop the US tightening despite Yellen's rhetoric. The problem is the measure of GDP, it's being used far wider than it's real usefulness. Japan continues to export massively and that is why it is able to continue and the weaker currency actions help that. The idea that a new govt would tighten monetary policy is pure speculation on your part.